Coco Peat is produced following Dutch RHP guidelines & delivers a full 50 liters of buffered and washed premium quality coir in a recyclable bags. Our RHP Xtreme Coco Peat is 100% organic growth medium, free from chemical additives and soil disease. Its uniform structure provides consistent, high performance results that you can count on. 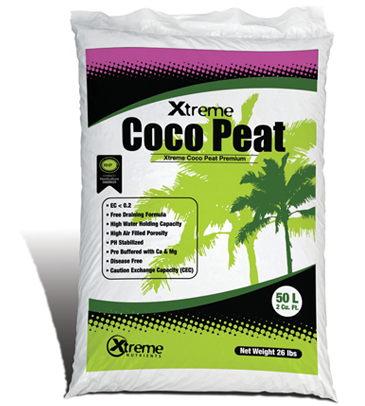 Xtreme Coco Peat is the perfect combination between water retention and air circulation with water holding capacity of 75%, air fill porosity of 25% and soilds material 10%, these allows the growers to steer substrate water content on a daily or seasonal basis. Manually: Water Daily with coir Specific Nutrients. Automatically: Water 1-3 Times a Day with Coir Specific Nutrients. Free Draining: No Clay or other additives required to Facilitate Water Drainage.